Vogue White Kraft Paper Bags 250 Pk 16x6x12-1/2"
Vogue size White Kraft Paper Shopping Bags by the carton. 65# paper weight. Made in the USA. 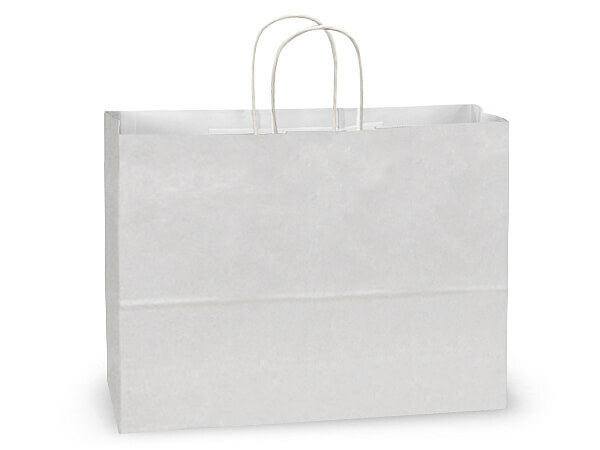 Our wholesale white kraft paper gift bags are white inside and out, with white paper twist handles. We offer these bags in bulk cartons and small packs of 25 or an assortment of sizes available! You can easily dress up these bags for any occasion with our printed tissue paper! We offer sizes ranging from small to x-large, including wine bags and extra wide gussets for food service and take out! Proudly Made in the USA!